Making a storyboard begins with writing the script for your project. In Storyboard Pro, you can import your script into your project. You can then store each part of your script into their corresponding storyboard panel, to provide the storyboard artist with the information they need to draw the panels. 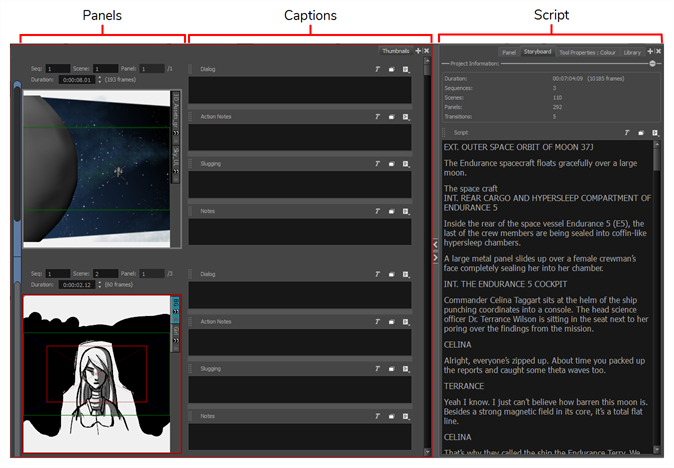 By default, each panel can store four different types of captions: Dialogue, Action Notes, Slugging and Notes. The Dialogue and Action Notes can be sourced straight from your script, and Notes can be used to store information such as scene headings, transitions and other useful information. Slugging captions are typically added later, while making the storyboard, to give timing indications regarding the dialogues and actions for the animatic. You can import a script in plain text (.txt), Rich Text Format (.rtf) or Final Draft XML (.fdx) directly into the Script field of the Storyboard view. You can also copy and paste it from your editor, or type it directly into the Storyboard view. 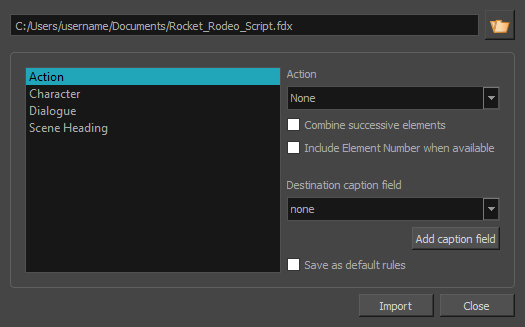 If your script is in plain text (.txt) or Rich Text Format (.rtf), select Import Caption. If your script is in Final Draft XML (.fdx) format, select Import Final Draft Script. In the file browser, locate and select your script file, then click on Open. Once your script is imported, you can create the basic structure of your storyboard by creating empty scenes and panels based on the scene headings, actions and dialogues of your script, then filling the caption fields for each panel in your storyboard with information from your script. To do this, you can select an excerpt from your script in the Storyboard view, then drag and drop it into a caption field in the Panel view, instantly copying the selected text into the caption field for the current panel. NOTE To learn how to create scenes and panels, see How to Add Scenes and Panels. In the Workspace toolbar, clicking on the Vertical Workspace button. From the top menu, select Windows > Workspace > Workspace > Vertical. In the right pane of your workspace, select the Storyboard tab. Your workspace now has a vertical roll of each panel in your storyboard to the left, with their corresponding caption fields in the middle, and the script for your storyboard to the right. In the Thumbnails view, scroll to the panel in which you want to add captions. In the Script caption field of the Storyboard view, select the part of your script that you want to add to a panel caption. In the Script caption, drag the selected text and drop it in the appropriate caption field of your panel. Repeat this until you have copied all the necessary text for each of your panels into their caption fields. Once you are done, you can restore the workspace you were using by selecting it from the Workspace toolbar or from the top menu, in Windows > Workspace > Workspace. NOTE You can also drag and drop text from any panel caption to another panel caption, or from a panel caption to the script. 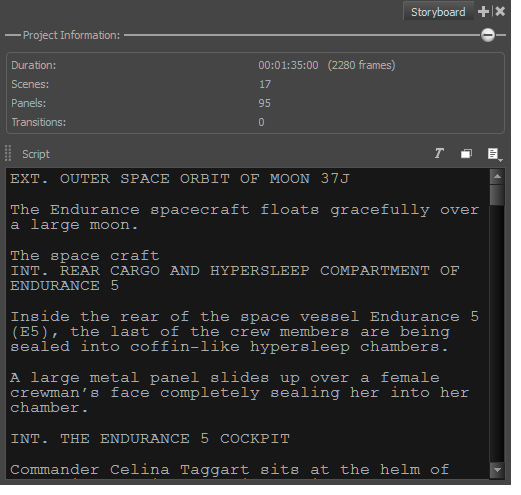 If your script was written in Final Draft, you can automatically generate a project with scenes, empty panels and pre-filled captions based on the structure of your script. For example, you can generate a project with a new scene for each Scene Heading and a new panel for each action or dialogue, and store the content of these paragraphs into the caption fields of their panels, allowing you to kickstart the storyboarding process. The Import from Final Draft dialog opens. In the file browser, locate and select your Final Draft script, then click on Open. Once your script is loaded, the types of tags contained in your script will appear in the list to the left. You will have to indicate to Storyboard Pro what to do with each of these tags when generating your project. In the Action drop-down, select New Scene. In the Destination caption field drop-down, select Notes. 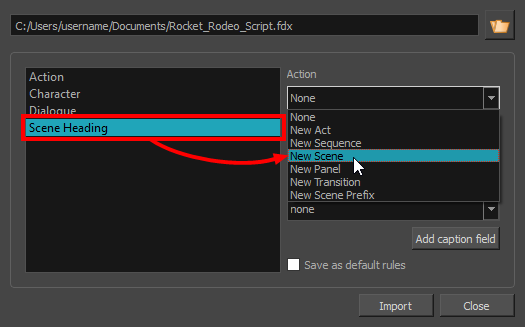 If your Scene Heading elements are numbered in your script and you want to include their number in your project's captions, check the Include Element Number when available option. Your storyboard will have one scene for every scene heading in your script, and the scene's description will be added to the Notes caption of every first panel of every scene. If you want one panel to be created for each action, select New Panel in the Action drop-down. If you want consecutive actions to be combined in the same panel, check the Combine successive elements option. In the Destination caption field drop-down, select Action Notes. This will store the content of the action tag into the Action Notes caption of each panel. If your Action elements are numbered in your script and you want to include their number in your project's captions, check the Include Element Number when available option. If you want one panel to be created for each dialogue, select New Panel in the Action drop-down. In the Destination caption field drop-down, select Dialogue. If your Character elements are numbered in your script and you want to include their number in your project's captions, check the Include Element Number when available option. If your Parenthetical elements are numbered in your script and you want to include their number in your project's captions, check the Include Element Number when available option. If your Dialogue elements are numbered in your script and you want to include their number in your project's captions, check the Include Element Number when available option. In the action drop-down, select New Transition. NOTE Depending on the way your script is structured and on how much the action or dialogue drive the pace, you might have to try creating a project with your script using different options to get the best storyboard structure for your needs. In the end, it is likely that you will have to split or combine some of the automatically generated panels. If you want to make the currently selected parameters default, check the Save as default rules checkbox. In the New Project dialog, enter the name, location, title and resolution for your project. If the currently opened project was not saved, confirm whether you want to save it. Your new project is created, with scenes and panels automatically created and their captions filled with excerpts from your script, based on the settings you selected.